Maria Suleman enters play insane. 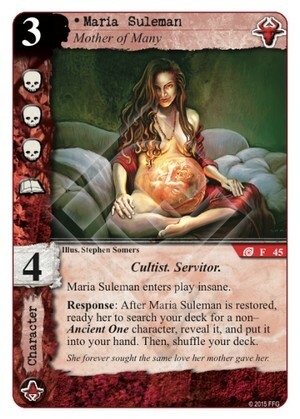 Response: After Maria Suleman is restored, ready her to search your deck for a non-Ancient One character, reveal it, and put it into your hand. Then, shuffle your deck. Flavor Text: She forever sought the same love her mother gave her. Shub has other ways to tutor characters, but getting a combat-savvy cultist on top with the same card and being able to tutor multiple times with the right setup is very strong. Like her green cousin Mandy, she can justify her spot even without ways to drive her insane again. 5/5. The association of the last name is hilarious! What I especially like about her, is that it's not restricted to Shub characters. Tends to be the case with tutors. I had to look up the name to know what Greynomad38 was talking about. Likewise. The illustration resembles Nadya , which rhymes with Maria, so its hardly subtle.